There are few true sports giants in the world. People who can distract a whole room. People like Willie Mays or Junior Johnson. Arnold Palmer was one. I had an opportunity to watch Palmer play a few holes at the pro am at the Well Fargo tournament in May of 2011. 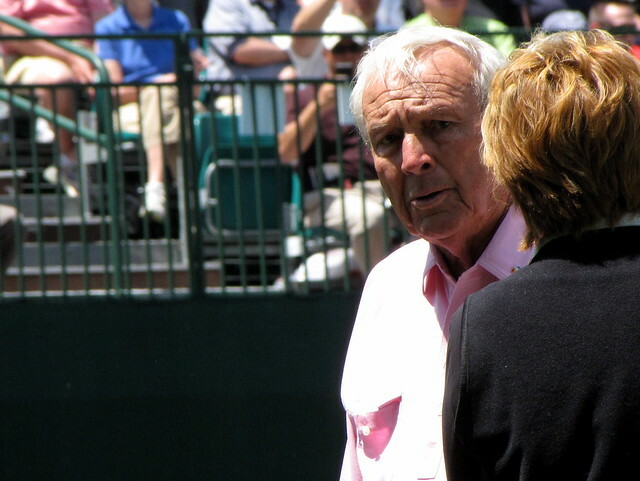 There was a palpable buzz on the course because Arnold Palmer was there. There was a constant stream of love washing over him the whole time. Grown men yelling his name and thanking him for being there. Two things stand out from that day. I watched him scarf down a hotdog in under thirty seconds and he played from the black tees because it would have been beneath him to play from the senior tees. That wasn't a great decision because he was unable to reach the fairway off the tee but he hit 'em straight.